Limted to 1,000 numbered copies. The tenth anniversary of BattleTech’s creation was celebrated by this interesting manual, which collects and revises all the material from BattleTech 3rd Edition, CityTech 2nd Edition and the original 1990 BattleTech Compendium. 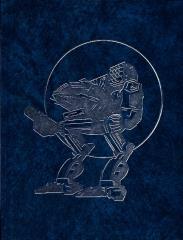 A very clear manual that is even interesting just to read for fans of Sci-Fi technology. It is indispensable to have all together anything concerning rules, technologies and equipments of the BattleTech universe. There is also a short chapter reporting some basic rules to play on 3D scenarios.